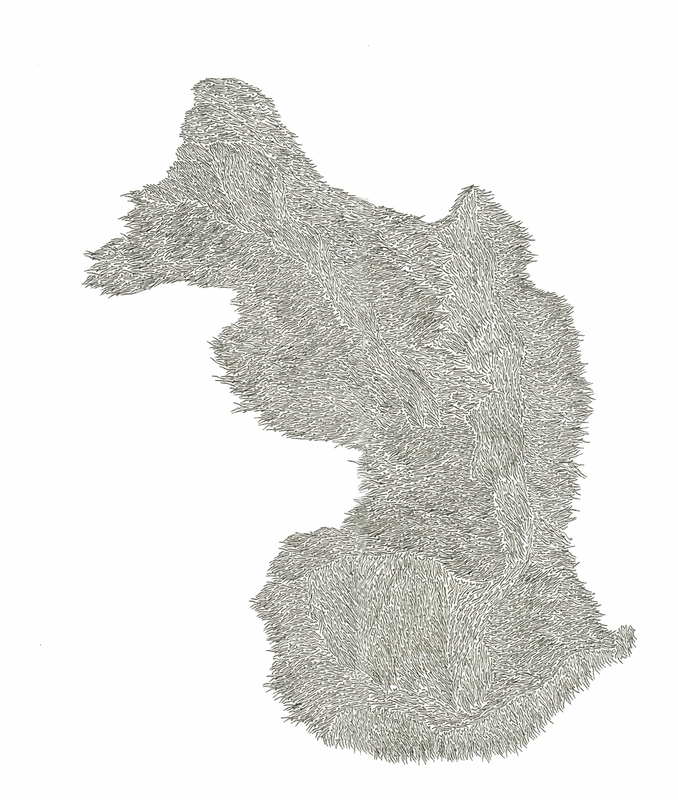 Cos Cob, CT, November 2013 - The Drawing Room Gallery is pleased to announce the opening of their anniversary exhibition, "Drawn: Exploring Contemporary Drawing", which runs from November 16th, 2013 - January 13, 2014. This eclectic exhibit explores what it means to create a drawing in the most contemporary sense, by bringing together the works of Edward A. Kingsbury, (Keene, NH) David Litchfield (Bedfordshire, United Kingdom), Ali Osborn (Brooklyn, NY), Rick Shaefer (Fairfield, CT), and Eliza Stamps (Brooklyn, NY). There will be a reception with the artists on Saturday, November 16, from 6:00-9:00 p.m. which will also celebrate the one year anniversary of The Drawing Room Art Gallery. The exhibit and reception are free and open to the public. This exhibition of contemporary drawing shows how five artists defy the traditional and take on new forms of representing their subjects. Driven by the power of the drawn line, each artist has developed a clearly defined and methodical visual language. Their unique conceptual approaches inspire carefully composed drawings that elicit an emotional response from the artists’ personal modes of thought and visual expression. Edward Kingsbury's works are a focused subconscious movement of a fine point pen on paper. His disciplined drawn arrangements of abstract, dense formations are inspired by thoughts and moods occurring during the artist’s creative process. Kingsbury's intention is to provide a unique depiction of life, allowing the viewer a “plethora of visual stimuli”, while still portraying a sense of peace. Each work illustrates a balancing act between intuition, restraint, & the formal decisions that make each drawing so visually compelling. David Litchfield’s prolific illustrations combine imaginary tales, strange fantasies and bold adventures executed in pen, pencil and ink. Each of his drawings on display are culled from a larger body of work, which include 365 Illustrations from his “A Drawing a Day” project. This project not only demonstrates Litchfield’s passion for drawing, hilarious sense of humor and refreshing imagination, but also embodies sincere expressions of joy, wonder, awkward despairand irony. His stylized approach reveals a keen ability to translate the world into compelling visual storytelling of exceptional humor and guilelessness. Each drawing incorporates complex patterns of mark-making techniques and use of color that lift such vivid, magical and dream-like scenarios from the page, and into life. Ali Osborn's incredibly realistic drawings bear a need to depict the everyday object in an uncommon and curious light. His pieces reach further and are more expansive than the things they represent. Osborn depicts objects and detritus out of context, flattened, saturated in color, elevated, shrunken, magnified, or transformed…demonstrating to the viewer that the representation is more interesting, funny, cool, sad, or serious than the object itself. The final product is beautifully familiar and recognizable, and yet also illusory eerily new, and oddly ideal, like a specimen taken from the field. Rick Shaefer is inspired by integrity of the line – whether it’s a single stroke or a mass of scribble in the shadows. His monumental drawings take on the challenge set by scale, of which he approaches with an extremely gestural and calligraphic hand. Shaefer lays down line by line with a writer’s hand in a spontaneously invented language with looping cursive gestures, larger flourishes, and tight punctuations. With a visually melodic rhythm, Shaefer writes his way across the surface as if he were capturing thoughts in a frenzied rush of note taking. Looking closely at his pieces, the viewer will notice the great flux of tonality formed not by rubbing and smudging; but with the careful build-up of every carefully composed line, which collectively provide genuinely striking and honest visions of our present world. The work of Eliza Stamps is an exploration of aesthetics, performance, mark making and intimacy. Her compositions are not preconceived. Rather, she creates patterns that begin to uncover the general structure & conceptual foundation of her work. Within her finely tuned drawings, there is a deep concern for the formal considerations of balance, the play of lights and darks, and the perception of beauty itself. It is this ongoing dialogue between the drawn image and her use of reactive mark making that inevitably creates each work and it’s distinctive visual qualities. Each of these talented artists single handedly influence new visual experiences for their viewers, and together, allow “Drawn”, to investigate the unrivaled beauty and explorative process of contemporary drawing.